Takeaway: These 6 poses will help runners stretch, build flexibility and develop whole body awareness. Gone are the days when coaches insisted that runners should only run. It is now widely recognised that cross-training, which is integrating a number of approaches into a training programme, is far more beneficial. As a runner, you want a yoga practice that complements your training. The best yoga practice will address areas that are not directly developed through running alone. It will also help runners to move differently, especially out of the sagittal (forwards and backwards) plane, in which most of the movement in running occurs. Yoga programmes can help runners develop whole body awareness. If you are a runner, you’ll know that running already gives you cardiovascular strength, stamina and power, especially in your legs. The list of postures below, therefore, focus on developing other elements of holistic fitness. The key thing to remember? Go slowly and be gentle with yourself! Running training tends to be very yang, which means it's active, dynamic and fast. To complement this, let your yoga practice be slower, deeper and more mindful. This will help your recovery, and holding the postures for longer will maximize their benefits. For more active postures, aim for 5-10 slow deep breaths in the posture, whereas seated and supine postures can be extended to a minute or more. Think yoga is all about lounging around? Think again! Postures such as plank pose are fantastic for energising your whole body and building core strength. The stronger your core, the more your arms and legs will be able to move efficiently when you run. (Want more core strengthening? Try this 15-minute core strengthening yoga sequence.) Core strength improves your form, reducing your risk of injury. Try it as part of your warm up to reap the benefits as you run. Alignment advice: Make sure your hands are directly beneath your shoulders, with wrists, elbows and shoulders stacked vertically. Aim for one straight line from your heels to the crown of your head - no hiking your hips up or allowing them to sag down. Visualise the front of your body drawing towards the back of your body, and don’t forget to engage your glutes. Now to release tight hips. From your plank pose, step your right foot through to the inside of your right hand and let your left knee lower to the ground, moving it further forward if you need to. Low lunge pose provides a delicious stretch for your hip flexors, muscles which work very hard for you when you run. If there’s any sensitivity in your left knee, place a folded blanket or cushion pad underneath it. To intensify the posture (and only do this is your body is genuinely wanting more! ), walk your hands up onto your front thigh. This may help you to feel more sensation through the torso. The next step is to reach your arms up over your head, bringing the palms together or keeping them shoulder width apart. Keep your right hip drawing back and your left slightly forward so your pelvis stays square to the front. Don’t forget to repeat on the other side! Having released the front of your hips, it’s now time to work into your outer hips - your glutes, piriformis and IT band. Pigeon posture is often recommended for runners for its glute-releasing benefits, however it can be put torsional pressure on the knee (not a good idea for a hinge joint!). It can be challenging for runners with stronger, tighter pelvic musculature. Personally, I prefer standing figure 4 pose, which also improves balance and proprioception, without putting the knee at risk. How to get into the pose: From standing, lift your right leg, externally rotating and abducting your thigh, so that you can cross your right ankle ankle over top of your left knee in a Figure 4 position. Keep your hands in prayer position at the centre of your chest. Bend your left knee and take your hips back, as if you are sitting into a chair behind you. Lower your hips only until you to feel a stretch sensation into the outer hip and glutes. Including a gentle backbend in your recovery yoga is a great idea, as it releases the muscles of the chest and abdomen, which can become tight through running. It also engages the posterior chain of muscles, especially the glutes and hamstrings, so it can be valuable as part of your warm up. Finding your bridge pose: Begin lying on your back and step your feet in so that your heels are close to your sit bones. Keep your arms by your body, palms facing down. On an inhalation, press your feet into the ground, expand your ribcage and reach your hips up towards the sky. Try to keep your neck and shoulders relaxed with some space between your chin and your chest. Stay here, or to go deeper, interlace your hands underneath your back and work one shoulder blade at a time underneath so that you are supported by the outer edge of your arms. This brings a greater opening to the fronts of the shoulders and chest. 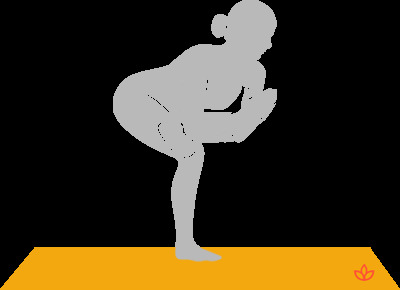 Keep the tailbone reaching towards the knees to lengthen the lower back. Hamstrings, hamstrings, hamstrings. Many runners complain of tight, inflexible hamstrings, and reach for their toes with straight legs to demonstrate just how far their hands are from the floor. However, for those with strong hamstrings, aggressively launching yourself into an unsupported forward fold is only likely to cause injury - most commonly of the hamstring attachments or the lower back. A better option? Work with your hamstrings lovingly and gently. After all, you need them to be strong and healthy for running. Adapt any postures that stretch the hamstrings by bending your knees as much as you need to, and only ever work to the “soft edge” of sensation, not the hard edge. Reclining big toe pose is ideal because the lower back is supported on the ground. Hug one knee into your chest before reaching the foot up towards the sky, keeping a bend at the knee. Loop a strap around the sole of your foot so that you can keep your head and shoulders on the ground as you find the perfect position to breathe into the sensation. What is one of the most important elements of a running enthusiast’s training schedule, too often neglected? Rest! Rest is essential to ensure adequate recovery, and let you reap the benefits of your efforts. At the end of your yoga practice, savasana, the final resting posture is where you allow your body and mind to settle and absorb the nourishment of the postures you've done. This is doubly important if you’re practicing yoga on a rest day from running - give yourself plenty of time here, ideally with an eye pillow or mask to really block out the world and let your focus turn inwards. Set a timer if you’re worried about falling asleep or losing track of time, and see whether you can allow yourself to stay for at least 5 minutes, ideally 10 or 20. Yoga has much more to offer runners than simply the physical benefits of asana practice, as great as they can be. Remember that the asana work is actually a tool for anchoring your mind in your body, building presence, awareness and inner peace. Stay close to your experience throughout your yoga practice and embrace all the learnings that come to you. You can be sure that they’ll be of benefit in your running too.